In this application note, we will show you some basic acoustic analysis techniques that you can apply to measurements of your listening room made with the UMIK-1 and Room EQ Wizard (REW). The main measurement plot shows a frequency measurement graph in red. At the left is a small "thumbnail" version of the measurement - each time you make a new measurement, a new thumbnail will appear here. At the top of the screen are buttons that access various tools and immediately above the measurement is a row of tabs that show different "views" of the measurement. Change the color of the plot. Click on the "brush" icon next to the thumbnail and select a color. Add some smoothing to the graph. From the Graph menu, select "Apply 1/6 Octave Smoothing." Now we can examine in more detail what we have here. The scale along the bottom shows the frequency range, in this case 20 Hz to 20 kHz (20,000 Hz). At each frequency, the UMIK-1 has picked up a sound pressure level (SPL), which is the vertical height of the graph at that point. The scale at the left shows the SPL, which we have set to go from 50 to 90 dB. For example, at 100 Hz the SPL is just under 75 dB. Why is the graph so uneven? Shouldn't we have a flat frequency response? Mostly, it's because of the room. Room modes (resonances) and reflections in a room act to make a nice flat loudspeaker response into a roller-coaster. Recall that we applied smoothing to the graph. An in-room measurement has a lot of reflections that create peaks and dips in the frequency response. Above 250 Hz or so, much of this is not relevant to what we hear, so for full-range measurements, 1/3 or 1/6th octave smoothing is generally used. For graphs limited to the low frequency range (up to say 300 Hz), use 1/24, 1/48 or no smoothing. 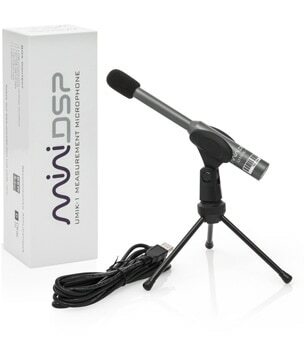 miniDSP offers products that can be used to equalize a system or apply full-range room correction, such as the nanoDIGI 2x8 (digital in-out, parametric EQ), miniDSP 10x10 HD (multichannel analog in-out, parametric EQ), and OpenDRC-DI and OpenDRC-AN (digital or analog in-out, FIR filtering and room correction). Note that equalization for room correction should generally make use of multiple measurements over the listening area, as measured response will change with microphone position. Sound generated in a room decays over time. You've probably been in a "live" hall where footsteps echo and a handclap can be heard to decay over seconds. In other rooms, sound decays very quickly. A convenient measure for this is the reverberation time, or the time that a transient sound takes to decay by 60 dB from its initial level. For home listening rooms, this measurement can be considered relevant above about 200 Hz. Recommended values of reverberation time depend on the type of system (e.g. music or home theater), the size of the room, and the type of speaker. However, 300 ms to 500 ms (0.3 to 0.5 seconds) is a commonly recommended range. It can be seen that this room is within this range but towards the high end for a good part of the frequency band. DSP equalization can't change reverberation time. Heavy drapes and carpets will reduce reverberation time, but if you need to go further, then dedicated acoustic treatment may be required. This plot shows that there are slowly-decaying resonances around 26, 30, 57 and 74 Hz. With this type of graph, you may need to adjust some display parameters on the Controls and Limits popup windows to get the most useful and informative plot. Resonances like this can be addressed with a range of techniques: by equalization (if they show up as peaks in the frequency response measurement), by moving and placement of speakers or subwoofers, by the use of multiple subwoofers, and by extensive bass trapping. A plot that shows the same type of information in a different way is the spectrogram. You may find this plot easier to interpret in some cases — in particular, it can be useful to highlight resonances after equalization has been applied to address measured frequency response peaks. With all of these plots, you can click on the camera button and save the plot as an image. This will make it easier to share your measurements with others and for "before and after" comparisons.